Leah Porrata is the Director of Education for Gulfshore Playhouse. School is back in session, and so are our Fall quarter Education programs here at Gulfshore Playhouse! Our first quarter of STAR Academy After-School classes are underway – we’re focusing on musical theatre this fall, so if you visit the Norris Center on certain afternoons, you’ll hear the tapping of little toes and the chiming of little voices as our STARs (Student Theatre Artists in Residence) learn the art of acting, singing, and dancing. Our younger students are learning about props and costumes as they don sparkly tutus and wave magic wands in their numbers, while our older students are focusing on character development, more complex choreography, and reading music. We’re also hard at work scheduling our ThinkTheatre in-school residencies for this school year, which will be funded for the eighth consecutive year by the Suncoast Credit Union Foundation. We couldn’t be more grateful for this generous grant, which allows the Playhouse to conduct theatre arts-integrated residencies in schools with at-risk populations throughout Collier and Lee Counties, aligning with the Florida Education Standards for both theatre and core curriculum and giving students and educators alike a unique and immersive classroom experience. Beyond these exciting programs, though, Gulfshore Playhouse Education has already experienced a milestone this school year: Our very first official Student Matinee! Student groups have made trips to the Playhouse before, and we have long offered a significant discount on tickets for students. But this season, when we knew we would be co-producing The Glass Menagerie with Weston Playhouse, we knew that Tennessee Williams’ masterpiece of a play could be a wonderful way to reach the students in our community through a field trip opportunity. Many high schools across the country include The Glass Menagerie in their required reading lists, and schools in Collier County are no exception. So we reached out to our local educators, and the response was more than we had hoped for! By the time our Student Matinee rolled around, we had tickets reserved for over a hundred students and about a dozen educators and chaperones. School groups as nearby as central Naples and as far away as Everglades City, public and private, low-income and affluent, were excited to make the trip to Gulfshore Playhouse to experience Williams’ oft-studied text in a tangible and engaging way. The afternoon of the Student Matinee, armed with piles of carefully crafted Student Guides and fistfuls of bundled tickets, my colleagues and I waited by the Norris Center’s front doors, eagerly anticipating the arrival of busloads of students. One by one, the big yellow buses unloaded dozens and dozens of students. They poured through our doors and filled up the lobby, the courtyard, and the hallways of the building. They giggled and explored and talked with their friends. Many had dressed up for the occasion. They were a diverse group, and their enthusiasm was infectious. Making students feel welcome in the theatre is, in my opinion, one of the biggest challenges that the American theatre faces today. For too many young people, theatre is inaccessible – not just due to ticket costs or location, but because they feel that theatre is irrelevant to their lives. What could the theatre offer them that they can’t get at the movie theatre with their friends, or by streaming television shows on their devices? To many students, the theatre feels austere, forbidding, and outdated. But today’s students are tomorrow’s theatre professionals, patrons, and supporters. Children are, as we all know, the future. And so, we here at Gulfshore Playhouse did our very best to make these students feel welcome at the theatre. Our wonderful ushers offered them programs and showed them how seating is assigned, helping them find their seats and complimenting them on their outfits and hairstyles. Our staff passed out Student Guides and distributed tickets, greeting the groups warmly as they entered the theatre. Other staff members and volunteers helpfully pointed out bathrooms and concessions, and answered the students’ steady stream of questions about the play, Gulfshore Playhouse, and theatre in general. Once everyone had arrived and was seated – right on time if not early, I might add – the lights dimmed, and Act One began. I waited nervously in the lobby, wondering what the students’ reactions would be to the first act. Would they connect to the play? Would their Student Guides be helpful? Would they feel as though the theatre is somewhere they belong? When the doors opened for intermission, my fears were quelled. The students were already raving about the experience – I listened as they chatted to their friends about the actors, the set, the script, the lighting, and even the information in their Student Guides. They were no longer unsure or nervously eager; it was apparent that they were both at ease in the theatre, and excited to be there. They rushed to concessions, quickly clearing us out of KitKats and coffee. The coffee, in particular, was a hit – you could tell they felt very mature, sipping their café au laits as they discussed the show by the fountain in the courtyard. And lovely they were. 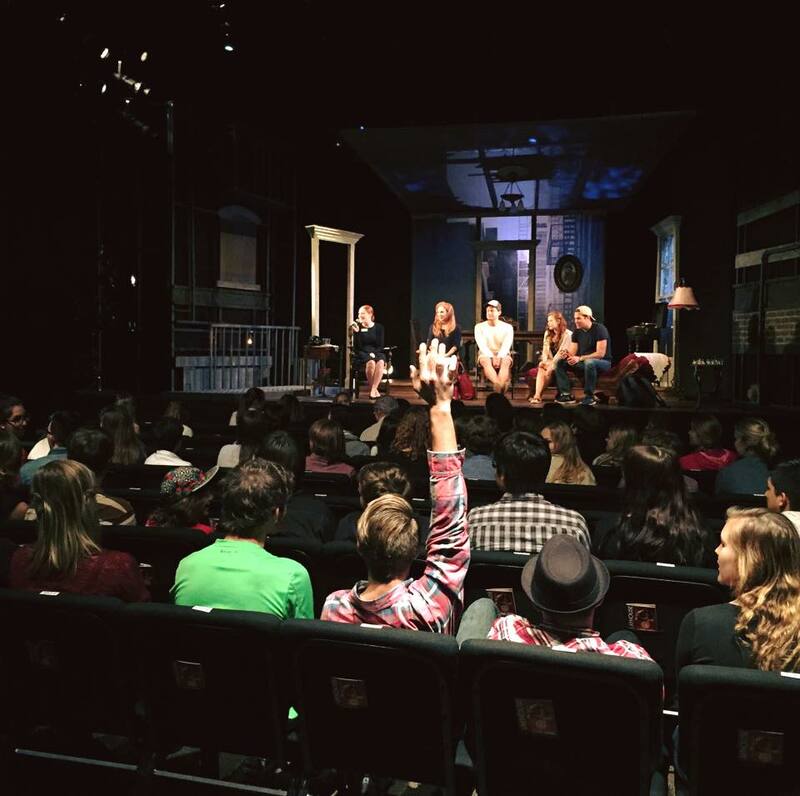 The actors were generous enough to donate some of their time to a post-show Q&A session with the students, who asked insightful questions and listened intently to the wisdom of the performers. The air was full of “Thank yous” and compliments as the students boarded the buses. We received thank you notes from all of the teachers in attendance, all delighted with their students’ experiences. One of the teachers called the bus ride home from the Student Matinee “a highlight of my teaching career”, saying that her students were “wowed by the production” and “inspired”, discussing everything from Williams’ writing to the production elements. Another teacher noted that the students’ trip had been the talk of her school, and that her students were so impressed that they were already planning to come to the next show on their own. The teachers were united in one sentiment in particular: That Student Matinees like this are “integral to encouraging the passion of our young artists”. We agree, and we couldn’t be happier to provide excellent and unique educational opportunities to our community. Just as the students and teachers have thanked us for the opportunity, we want to thank you, our patrons and supporters, for making programs like our Student Matinees possible. Thanks to you, the younger generation of theatregoers and theatremakers are able to experience the arts! Leah…Beautiful article….it’s wonderful reading this—about the students’ enthusiasm and interest—especially after our GSP brainstorming yesterday about the educational component of Gulfshore Playhouse’s community outreach efforts.